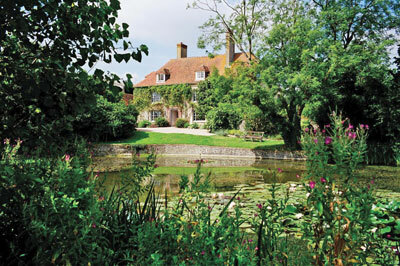 Charleston, near Lewes was the home and country meeting place for writers, painters and intellectuals of the Bloomsbury group, from 1916. Charleston is now celebrating 100 years since the group moved in, changing and marking the house as theirs, in their own unique way. At the head of the Bloomsbury group were artists Vanessa Bell and Duncan Grant, who moved to the remote Sussex farmhouse with their unconventional household. 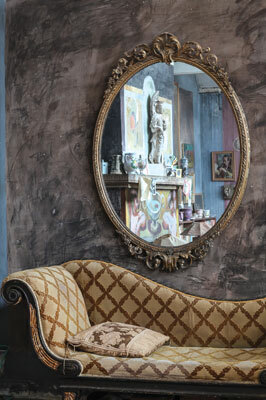 The artists decorated the walls, doors and furniture with pieces inspired by Italian fresco painting and the Post-Impressionists, displaying their unique decorative style within a domestic context and representing the fruition of over 60 years of artistic creativity. 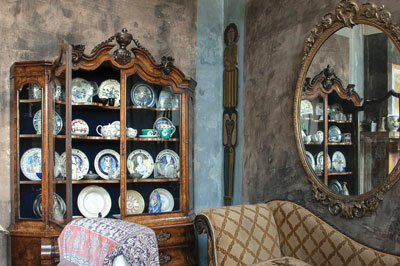 They filled the house with textiles, ceramics and works of other artists. Guests to the house would include Vanessa's sister, Virginia Woolf, Roger Fry, Lytton Strachey, T.S. Eliot and E.M. Forster and was also home to Clive Bell and Maynard Keynes. The house became a canvas for the artists to experiment on, displaying their daring and unrestrained approach to art and life. Vanessa Bell and Duncan Grant were pioneers of early 20th-century British art and created a hub of art and intellectual activity. In her own paintings Vanessa particularly liked to paint circles in different colours and combinations, cross hatching and was inspired by the incredibly beautiful garden designed by Roger Fry. Flowers and nature feature prominently in the designs. 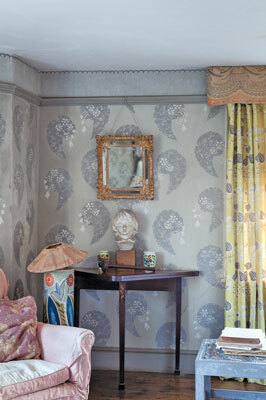 The couple painted the walls, chairs, bedsteads, tables, ceramics, designed fabrics and tapestries. When painting furniture they didn't properly prepare the surfaces; they weren't interested in longevity. If the paint wore through then another design could be painted on top. The paint style is loose and free and shows that the artists weren't afraid of the paint marks they were making. Everyone who visited Vanessa and Duncan was expected to bring an activity to do, such as painting, reading, etc. so it was a very active atmosphere where productivity and creativity was encouraged. Art was a way of life for the artists of the early 20th century, not just a career choice. Now, Charleston is considered to be one of the best small museums in the world. The fragile collection and uniquely decorated interiors are protected through careful consideration of limiting the number of visitors each day. This also allows the groups to get the best experience possible. However, as Charleston relies on making money from visitors, these necessarily limited numbers creates a problem with funding. The home and surrounding area receives no statutary government funding, relying on the income it generates across activities, donations and grants kindly provided by supporters. Charleston is an independent charity, which is now looking to rebuild, redesign and refurbish the site to pull in more visitors and enhance the opportunity to learn in a safe and secure environment. Every penny spent at Charleston helps open up the house for more people and to preserve it for future generations. Charleston is cradled beneath the majestic heights of Firle Beacon. It is a ramshackle ensemble of flint, brick and oak (Quercus robur) barns and cowsheds, which were a continual source of artistic inspiration, hence the attraction from the Bloomsbury group. Combining barns, the house and the gardens, the site has previously run smoothly together, but since the 1970s, the modern farm has functioned apart from the house; the Granary has unfortunately been demolished and the barns damaged by fire are now derelict. The house, however, is still presented to look as it did when the family lived there. 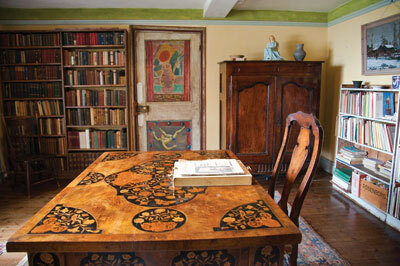 The rooms on show form a complete example of the decorative art of the Bloomsbury artists: murals, painted furniture, ceramics, objects from the Omega Workshops, paintings and textiles. The collection includes works by Renoir, Picasso, Derain, Matthew Smith, Sickert, Tomlin and Delacroix. Charleston was messy, creative and home to bohemians, who were experimenting with different ways of living. Vanessa Bell and Duncan Grant viewed their home as an extension of their lifestyle, so furniture wasn't purely for practical use, it was also a living experiment in creativity and the aesthetic appearance was incredibly important. Charleston shows that painted furniture can be beautiful and it surely must be one of the earliest examples of shabby chic. The walled gardens only add to Charleston's timeless beauty, which were created by the Bloomsbury group to Roger Fry's designs. 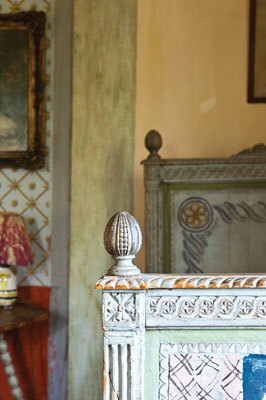 With Vanessa Bell and Duncan Grant at the helm, together they transformed vegetable plots and hen runs into a quintessential painter's garden, mixing Mediterranean influences with cottage garden planting. In the 1920s, a grid of gravel paths gave structure to beds of plants chosen by Grant and Bell for their intense colour and silver foliage. These became the subject of many still-lifes over their long residence at Charleston. Part of the garden's sense of luxuriance and surprise comes from the variety of sculpture it contains. Classical forms sit side-by-side with lifesize works by Quentin Bell, mosaic pavements and tile-edged pools. The orchard offers shade from the sun and the pond is a focus for tranquil contemplation. Above all, this was a summer garden for playing and painting, an enchanted retreat from London life. As Vanessa Bell wrote in 1936: "The house seems full of young people in very high spirits, laughing a great deal at their own jokes... lying about in the garden, which is simply a dithering blaze of flowers and butterflies and apples." The walled garden was later redesigned in a style reminiscent of southern Europe, with mosaics, box hedges, gravel pathways and ponds, but with a touch of Bloomsbury humour in the placing of the statuary. Omega Workshops was set up in 1913 by the artist and art critic Roger Fry. His idea was to create an art workshop/limited company that would employ artists part-time as artisan designers for a small wage. They would create work that would not be sold under their own name, but under the Omega brand - which was a square with the Greek omega letter inside it. 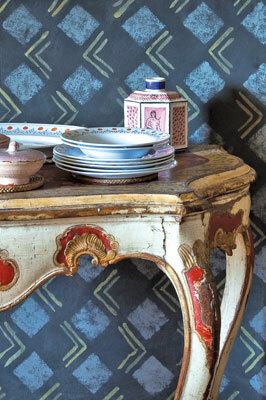 The work ranged from furniture, textiles, tapestries and ceramics inspired by contemporary art. The part-time nature of the workshop enabled artists to have time to create their own work alongside working for Omega. Vanessa Bell and Duncan Grant were friends with Fry and both produced work for the Omega Workshops. The workshop closed in 1919, but Charleston has original examples of Omega chairs designed by Fry in the dining room at Charleston House. In 1986, the Charleston Trust was founded to restore the house, which has been run ever since as a highly successful museum, attracting over 35,000 visitors a year. Quentin Bell was the Trust's first Chairman, describing his boyhood home as 'a kind of time capsule in which the public can examine a world which has vanished'. That time capsule remains the heart of everything the Trust stands for, but it is under threat unless Quentin Bell's inheritors grasp the necessity of advancing with the times. Charleston cannot afford inertia, either financially or culturally. Today, 27 years since the house opened to the public, the organisation has become partly a victim of its own success. The historic farm buildings are unfortunately falling down; they may be at risk from unsympathetic or unsuitable development unless Charleston takes them on. Galleries are now reluctant to lend exhibits that cannot be shown in a temperature-controlled and secure exhibition space. Portable spaces have to be hired in to meet demand for events. Charleston has run out of storage space for shop stock, garden and events equipment. The cafe serving and preparation space is too small to meet the public demand for meals in an out-of-the-way destination and staff are working in cramped and - at times - unhealthy conditions. The Charleston Centenary Project will provide a sustainable future for redundant and at risk rural agricultural buildings and will protect a section of historic landscape in the South Downs National Park. It will encourage visitors to enjoy and respect the rural environment. Plans include the restored barn and reconstructed granary, designed to make good use of energy efficient technologies. This will minimise future running costs and ensure that the Centenary Project is in keeping with Charleston's ethos of sustainable work practices. The project will be guided by a desire to find environmentally sound solutions that are sympathetic to the heritage of the site and will not alter the historic appearance of the barn or negatively impact on the surrounding countryside. The buildings will be refurbished using traditional materials, such as green oak and, where possible, building materials will be sourced locally and their 'embedded carbon' will be considered. Although the building project will generate a short-term increase in site waste and traffic, Charleston will consider the BREEAM assessment criteria and adopt a site waste plan to minimise the negative impact of waste produced. The rural environment of the project will be taken into consideration to ensure minimum impact on the biodiversity of the area. With the new development work, new visitors are inevitable, which will increase the volume of traffic but as part of the on-going work, Charleston will continue to work in consultation with East Sussex County Council and the South Downs National Park Authority to promote 'Tourism without Traffic' with Green routes to Charleston already developed. Charleston now runs a year-round Adult 'what's on' programme which features high quality masterclasses with experts and leading craftspeople. All the workshops include a guided tour of the house to inspire creativity, a gorgeous artisan lunch and small groups that give individuals opportunities for one to one tutor support. Upcoming workshops include gilding and painted furniture. 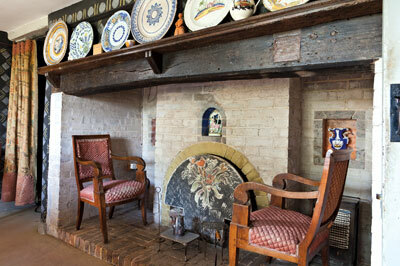 So, if you do get the opportunity to visit Charleston House, we urge you to do so. The house is open until 1 November and there is a host of activities and events going on during this time. Pick up the third copy of our brand new magazine today!